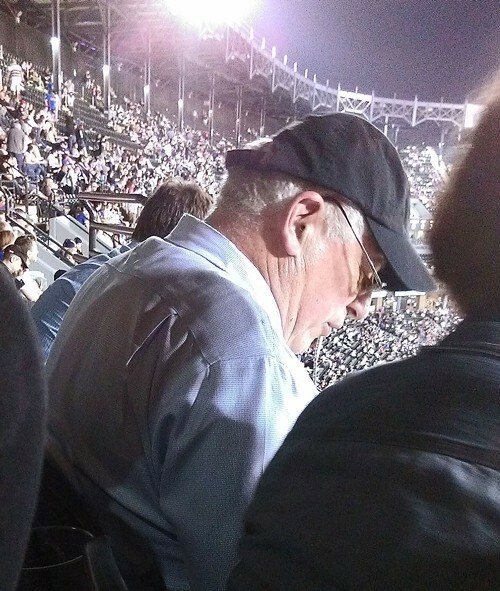 Governor Pat Quinn at last night's Sox-Cubs game on the south side. It was a beautiful evening for baseball, finally, so the governor and I decided to take in the White Sox-Cubs game at U.S. Cellular. Unfortunately for Pat Quinn and me, who are both Sox fans, the Cubbies prevailed, 12-5. The governor and I did not actually go to the game together. I interviewed him once, before his last election, but I don't know him personally. We did, however, practically sit together last night, because we are both cheap. I had gotten tickets for my wife and I in the nosebleed upper deck. We were behind the plate, and way, way above it. The upper deck at the Cell is barely in the troposphere. It was built so high to accommodate the multiple levels of skyboxes below it. What the upper deck has going for it is the price. In the middle of the fourth inning, my wife nudged me and whispered, "Isn't that the governor in front of us?" "Don't be goofy," I responded. "What would the governor be doing in the upper deck?" Then I looked closely and, as usual, she was right. The man in the glasses, the tightly fitting Sox cap with the silver hair peeking out, and the checked sport shirt was indeed the governor. He was in a party of four in the row immediately in front of us, one seat to my left. I leaned down to him. "Governor—what are you doing in the upper deck?" He turned and said, "I've got season tickets here. Had 'em ten, 11 years." "But why in the upper deck?" He shrugged. "You can see the game." 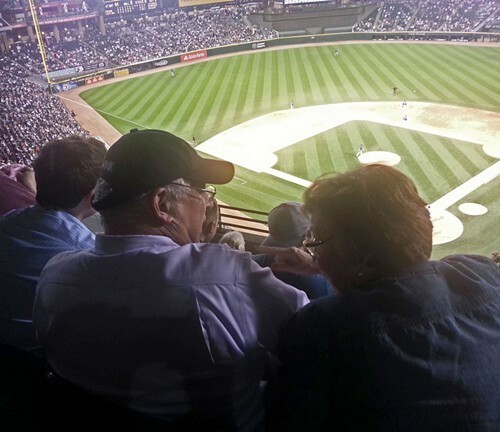 Quinn doesn't ordinarily look down on Chicagoans, but he does at Sox games. I know what he means: the height offers a nice perspective. But this benefit is mostly canceled out by the yawning span between you and the field. Even Adam Dunn looks small. And the sound delay is disconcerting—the crack of the bat you hear in the second inning was the double in the first. Then again, the price is right—or at least not as wrong as for the lower deck seats. Our tickets were $52 each. The upper deck tickets are usually less than that under the "dynamic" pricing scheme used by the Sox, but the game with the Cubs was a premium one. Lower deck seats were running twice as much. I shouldn't have wondered what the governor was doing upstairs, because he's famously frugal. Not the Bruce Rauner, I'm-just-a-common-private-equity-investor frugal: Quinn is genuinely tight, his wealth much less abundant. Rauner, Quinn's Republican opponent in this year's governor's race, owns six homes and three ranches. Quinn has five fewer homes and three fewer ranches. He lives in the west-side Galewood neighborhood, where he cuts his grass with a push mower. His only luxury, it seems, are the Sox season tickets—and even with them, he's cheaping it out. The game itself was a tedious affair. It lasted more than four hours and seemed longer. Cubs batters hit three homers; Sox pitchers hit three Cubs batters. (One of them, Welington Castillo, got nailed twice.) Each at bat seemed like an endless filibuster, the pitchers working slowly, the batters fouling off pitch after pitch. With a count of one and one, you could visit the restroom, grab a beer, buy a brat, and get back to your seat for the three-two pitch. It was apparent that almost no one in our section was aware that the governor was in their midst. At one point a woman in a blue Cub jersey who clearly did know him approached him, and they chatted briefly. After she left, I chastised him: "Governor, she may be a Democrat, but she was wearing a Cubs jersey." He chuckled and said, "I think she's really a Republican, but she's for me." The governor was distracted much of the night with a printed schedule of what appeared to be possible upcoming campaign fundraisers. (While my view of the field was mediocre, my view over his shoulder was outstanding.) He circled events, scribbled notes on a small pad, and conferred with the others in his contingent. He did take time to gobble down peanuts, and to stretch and enthusiastically sing "Take Me Out to the Ball Game" in the seventh. By the eighth, I was starting to care that we'd never get back. The game already was more than three hours old, I had to work in the morning, and the Red Line trip home promised to be as sluggish as the game. The Sox were down only 6-4, however, and it was still delightfully warm. Quinn seemed in no rush to leave. I began to worry that Illinois would have a groggy governor at the wheel the following day. But then Sox reliever Maikel Cleto walked two, plunked Castillo, and surrendered a Mike Olt grand slam that sent loyal Sox fans sprinting for the exits. Even Quinn and his party gave up and headed out. 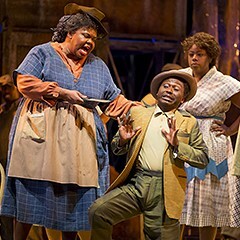 Illinois is presumably being governed by a fully rested governor today, and you can thank Cleto and Olt for it. On the bright side for Sox fans, because the south-siders scored in the fourth inning, those who were smart enough to keep their ticket stub can cash it in for a free, 16-ounce iced coffee at Dunkin' Donuts. So if you're in a Dunkin' Donuts today, look around for the governor.